Co-evolutionary theory assumes co-adapted characteristics are a positive response to counter those of another species, whereby co-evolved species reach an evolutionarily stable interaction through bilateral adaptation. However, evidence from the fig-fig wasp mutualistic system implies very different co-evolutionary selection mechanisms, due to the inherent conflict among interacted partners. 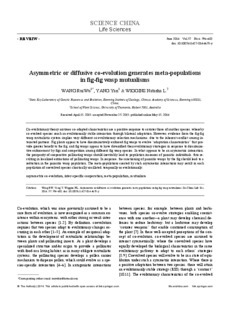 Fig plants appear to have discriminatively enforced fig wasps to evolve "adaptation characteristics" that provide greater benefit to the fig, and fig wasps appear to have diversified their evolutionary strategies in response to discriminative enforcement by figs and competition among different fig wasp species. In what appears to be an asymmetric interaction, the prosperity of cooperative pollinating wasps should inevitably lead to population increases of parasitic individuals, thus resulting in localized extinctions of pollinating wasps. In response, the sanctioning of parasitic wasps by the fig should lead to a reduction in the parasitic wasp population. The meta-populations created by such asymmetric interactions may result in each population of coevolved species chaotically oscillated, temporally or evolutionarily.